Daily life at Bishop Simon Bruté College Seminary in Indianapolis is marked by its seminarians taking classes at nearby Marian University and praying, sharing meals and recreation time with each other and the seminary’s formation staff. With a record enrollment of nearly 50 seminarians from one religious community and 10 dioceses—including 13 from the Archdiocese of Indianapolis—there are many more people sharing this common life than when Archbishop Emeritus Daniel M. Buechlein established it in 2004. On Sept. 21, though, many more people were at Bishop Bruté. The approximately 170 people who attended the seminary’s “Celebrate Bruté” event support the archdiocesan-sponsored college seminary. 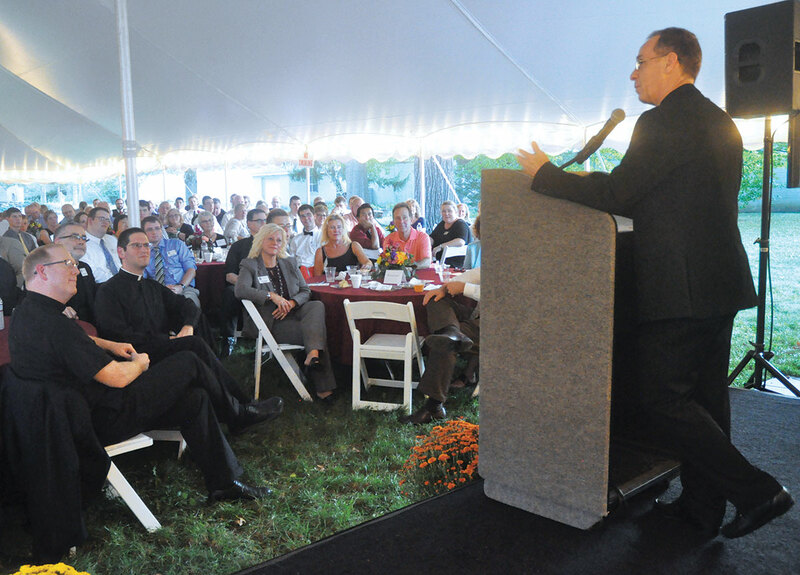 Archbishop Charles C. Thompson spoke to the attendees during a dinner on the seminary’s grounds, noting how much Bishop Bruté has grown in the 13 years since its founding. Two of those supporters were Steve and Ann Wessel, members of St. Simon the Apostle Parish in Indianapolis and parents of archdiocesan seminarian Charlie Wessel, who is a junior at Bishop Bruté and at Marian. Steve and Ann spoke to the attendees after a video was shown featuring their son speaking about the priestly formation that takes place at the seminary. “We like to say he goes to college but that he lives in the best fraternity in the world of brothers in Christ,” Ann said. “Our lives have become enriched through the opportunities that the seminary and his discernment have afforded us. Another supporter of the seminary at the event was Carl McClelland, a member of the Serra Club of Indianapolis, which promotes vocations to religious life and ordained ministry. For many years, he has helped lead an annual Serra Club-sponsored pilgrimage of eighth graders to Bishop Bruté that can help the teenagers see the priesthood as a real future possibility for themselves. Father Joseph Moriarty, rector of Bishop Bruté, gave thanks in remarks for the chance to live at the seminary. He is the successor of its founding rector, Father Robert Robeson. Archbishop Thompson reflected on the motivation that moves supporters of the seminary. “You’re here because you love the Church,” he said. “You’re here tonight because you love the priesthood. Whether you say a word to me or not, I know that’s why you’re here—your love for the faith, your love for the Church and your love for the Eucharist and the priesthood. At the end of the gathering, seminarian Andrew Alig, a sophomore at Bishop Bruté, spoke about having so many visitors to the seminary that he calls home.